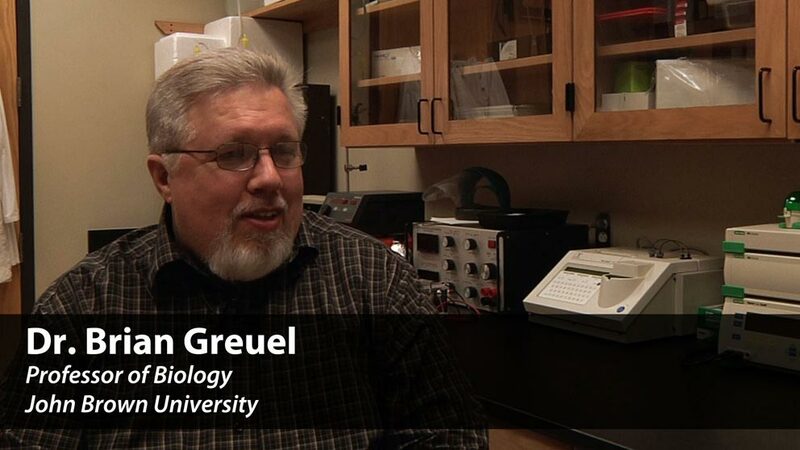 My name is Brian Greuel, I am the chair of the Natural Science Division, and also a professor of biology here. There’s a real emphasis not only on classroom teaching but also teaching in laboratory settings, so that students get to see practical applications of the concepts that they learn in the classroom. They’re learning how to work with their hands, they’re learning how to process data, to think critically. Five and a half years ago I got a grant from the Arkansas [unintelligible] Program. The focus of the research was to study gene regulation for a particular gene that is expressed in the central nervous system. I think there are a lot of benefits to participation in research like this. And I teach them how to use specific equipment, and do different kinds of experiments. My favorite course I would have to say is molecular cell biology. It just is a course that students experience a lot of aha moments. When an experiment works we have a jubilation moment where we celebrate that. We take a photograph just to capture that moment, just to remember that yes indeed, we’ve had successful experiments. There’s a real interest and appreciation for God as creator. We get to… explore God’s handiwork at a level that most people don’t get to do. Whether it be at the molecular level or the cellular level, that’s, those are just invisible to most people, but there’s beauty there. I’m a staunch Green Bay Packers fan, as many of my students this semester have discovered, as I have jubilated in the classroom a bit at the Super Bowl win.